Home Grapeland Family History Hill, James A.
Elisha Hill was born in Newberry County, South Carolina and at the age of 24 married Elizabeth (Zouter) Zuber, a widow with four children, Andrew, Adam, Nancy and Betsy. Elisha died at the age of 29 and left behind two sons, Jacob Albert and William Langdon Hill. Elisha’s wife was nine years older than he, and one of his step-sons, Andrew Zuber, married the daughter, Emily, of William Malone. William Malone had three daughters and each of them had several children. Dorothy Malone Chapman died at the age of thirty-five and her children visited often in the home of Andrew and Emily Zuber. The half-brothers, Jacob and William Langdon Hill also spent a great deal of time in their home. In 1843, an epidemic invaded the country in and around Newberry, S. C. and all Andrew’s household fell victims to it. Five died in five days; missing one day two were taken the next. Emily Zuber went before Andrew, as did the children and one of the boys of Mary Malone Jenkins. Andrew knew he would die and hastily made a will with directions for tombstones. He divided his property among his mother and all her children, including the two half brothers. The graves are to be seen in Enoree Cemetery next to the church where Jacob Albert Hill was ordained to preach. Old William Malone died a week later, probably of a broken heart. He had lost all of his family except for three grandchildren, Elizabeth and Mary Ellen Chapman and Marcus Jenkins. Jacob Albert Hill married Elizabeth Chapman in Newberry County, South Carolina in 1841. He was a Baptist minister. Jacob and his wife moved to Alabama where he was elected state representative in 1861. He favored secession and two of his sons, Andrew Malone and John Paul Hill, served with the Confederate Army, while he remained as a member of the Home Guard. John Paul Hill was killed in the battle of Franklin, Tenn., and is buried there. Seventy-six years later, a nephew of John Paul, James Daniel Hill (son of Dan Chapman Hill), led his men to victory in the battle of Leipzig, Germany, WWII and was given the battalion flag with its history. One of the victories of the battalion was the battle of Franklin, 1864, USA versus CSA. This battalion in 1864 had caused the death of his uncle. Jacob Albert Hill, wife and family moved to Texas with their children in 1876. He was minister of the Daly’s Baptist Church. Their children were Andrew Malone, born 1842 and married Emma Barbour; John Paul born 1844 and died 1864; Mary Elizabeth born 1847 and married A. T. Farrar; James Albert born 1852 and married Emma Catherine (Miltia) Dailey; Nancy Furman born 1855 and married George P. Isbell; Ellen Rocenda (Nellie) born 1859 and married Tom S. Kent; Daniel Chapman born 1862 and married Alma Amerial Hill; Ann Alberta born 1866 and married Harrell Tatum. Of these children only two remained in Houston County- James Albert Hill and Ellen Rocenda (Nellie) Hill. Ellen Rocenda (Nellie) married Tom S. Kent of Reynard and they later moved to Grapeland. (See Kent history.) 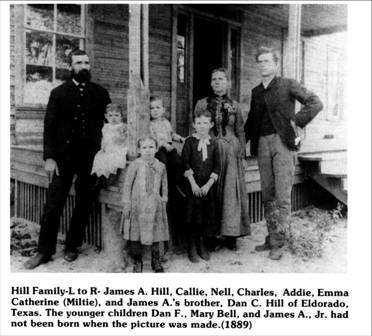 James Albert Hill married Emma Catherine (Miltia) Dailey. Emma Catherine Dailey was the daughter of Milton Dickerson and Caldona Isabella Beazley Dailey, Emma Catherine was nicknamed ‘Miltia’ for her father who died from wounds received in the Civil War. He was returning home to recuperate when he contracted measles. This in addition to his wounds caused his death. Miltia was only a few months old when her father died. 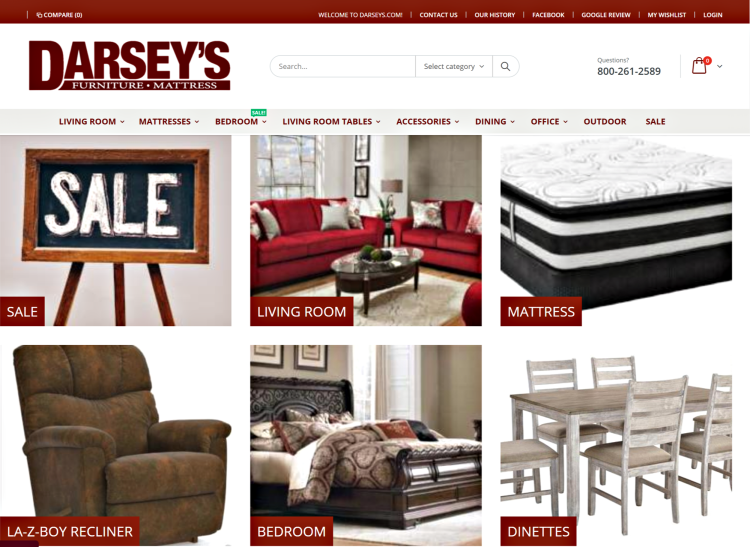 James A. Hill was in the general merchandise business with C. B. Dailey, his brother-in-law, in Daly. During the 1890s, Hill and Dailey also had a store in Grapeland. The Grapeland store closed when their cousin, T. T. Beazley, who managed the store died. J. A. Hill was active in the Farmers Alliance and was secretary of the Daly Baptist Church. He died from pneumonia in 1896. J. A. and Miltia Hill had seven children. The oldest daughter, Addie Dailey Hill, was born in 1881 and became a teacher. She taught first at Daly and later in Grapeland. She died in 1918-cause unknown (polio?). Nellie Irene Hill, the second child, was born in 1883 and married Frank B. Rhea of Forney. She also taught school in Grapeland, later moving to Forney and continuing her teaching. The elementary school in Forney is named the Nell Hill Rhea Elementary School. She retired from teaching at age 65, but each year until her death was called back to teach a new group of first graders. She had three children: Robert Milton, Carolyn, and Frank B. Rhea Jr. Callie Hill was born in 1888 and married Colonel Lee Walters. He was in the National Guard when World War I started and continued in the peace-time army until World War II started. He was ready for retirement in 1941, but stayed on active duty until the end of WWII. Upon retirement Callie and Lee Walters lived in Dallas. They had one daughter, Emma Catherine Walters, who taught high school mathematics first for one year in Elkhart, then in Grapeland for a year and a half. She then moved to Dallas and taught advanced placement math in the Highland Park High School until her retirement in 1986. Catherine Walters now lives in a home in Grapeland on the site of her Grandmother Emma Catherine Hill’s home. Daniel Forrest Hill was born in 1890 and never married. He served inFrance during WWI and returned home to go into business with his cousin, H. H. Dailey and Leota Dailey in Grapeland. He was a director of the Grapeland State Bank until his death in 1978. He lived in the home with his mother until her death in 1941. Mary Belle Hill was born in 1892 and taught school in Grapeland for a few years. She then moved to Dallas and worked for a magazine company until her retirement. James Albert Hill Jr. was born in 1895 and married Annette A. Bryant. He served in the U. S. Navy, until his death from cancer in 1936. Charles Cummings Hill was born in 1886 and married Myrtle Gossett of Crockett. Their family history is included in a separate article. Graeland.net was created originally to preserve the history or Grapeland and the memory of my parents, Charley & Ann Darsey. Grapeland.net has developed into a message/communication board for current events, churches, social events, and a balancing tool for the administrations of schools and city governments.